Vehicle may be raised on single or twin-post swiveling arm or ramp-type drive hoists. If using swiveling arm hoist, ensure lifting pads are positioned evenly on frame rails at points "A" and "B". Ensure lifting pads are not contacting transfer case or skid plate. All hoists should be equipped with proper adapters to support vehicle at frame rails only. Vehicle may be raised on single or twin-post swiveling arm or ramp-type drive hoists. If using swiveling arm hoist, ensure lifting pads are positioned evenly on frame rails and lifting pads are not contacting transfer case or skid plate. All hoists should be equipped with proper adapters to support vehicle at frame rails only. 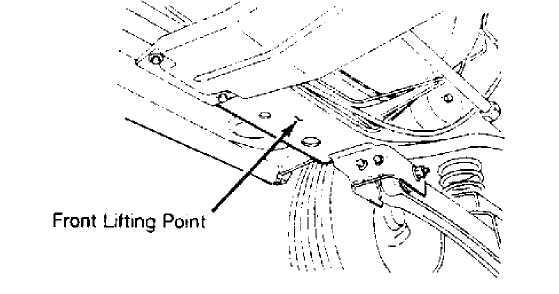 Vehicle may be raised by positioning jack at points "A" and "B" only. Never attempt to raise the vehicle with the jack positioned under the axle tubes, body side sills or front suspension arms. Use the sub frame rail lift points only. Vehicle may be raised by positioning jack under the front or rear frame rails. 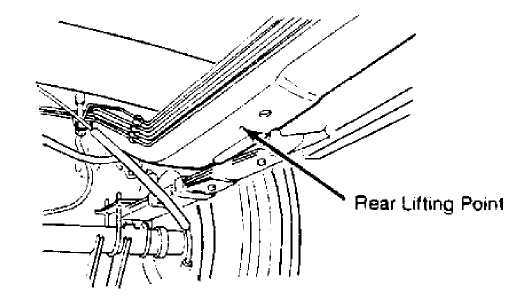 Never place jack under front or rear axle tubes, or under shock absorber mounting brackets. Position lifting pads evenly on frame rails.